Best. Card. Ever. George Calloway. | The Sketchcard Saloon. ← Artist Spotlight: Cat Staggs. Best. Card. Ever. George Calloway. Marvel Comics has a Man-Thing. It is a mythological muck monster that usually looks quite ugly. Given the limitless talents of George Calloway, however, this particular Man-Thing is magnificent. Regal. Royal. Resplendent. Standing ovation in the swamp. This entry was posted in Best. Card. Ever. 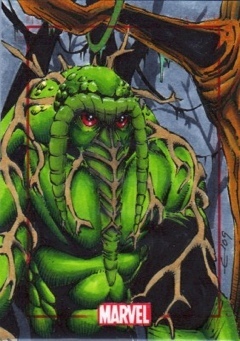 and tagged George Calloway, Man-Thing, Sketch Cards. Bookmark the permalink.